It’s been 9 years years (to the day) that my Mom passed away. Not a day goes by that I don’t think about her. Although she did not quilt, she was always very interested in whatever quilt I was working on. My Mom did a fair amount of travelling and she always returned home with quilting fabric of some sort for me. Ah, memories! This is the quilt that I made for my Mom. It brings back some lovely memories for me and for that reason, I cherish it. I started this quilt about three years before she passed. 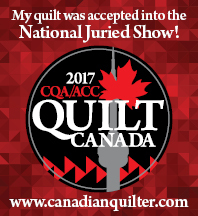 I chose a pattern that I could stitch together fairly quickly and I assumed I would just have it machine quilted and that would be that! But no, my Mom insisted that I hand-quilt her quilt. I put up a bit of a fuss…I was working full time and my three teenage kids always seemed to have to be driven somewhere. I just didn’t think I had the time to hand-quilt a queen sized quilt at that stage in my life. But, there was no arguing with her. Long story short, I set aside 1 hour every evening to hand-quilt her quilt. Those small chunks of time added up and before I knew it, the quilt was finished! Not long after I finished the quilt, my Mom was diagnosed with cancer and a year later, she passed away. I had some of the navy blue fabric left over and I have used it in a few special quilts. I used the fabric on my “Bouquet For A New Day”…. …and, I also used it for one of the birds in my Civil War Bride quilt. Where will the special fabric show up next?